This week is about recapping all the projects I’ve been working on, so let’s kick things off with some code, shall we? I recently worked on a site for Mr Blacktooth himself, Carey Haider. He had a really clear design in mind for himself, so I just spun up the code on this one. Whether he’s posting photos, apparel design, and video- he never fails to entertain me. Go check out what Carey’s been up to– you’ll be glad you did! This looks great! I love the contrast of the simple text/stripes and bold images. 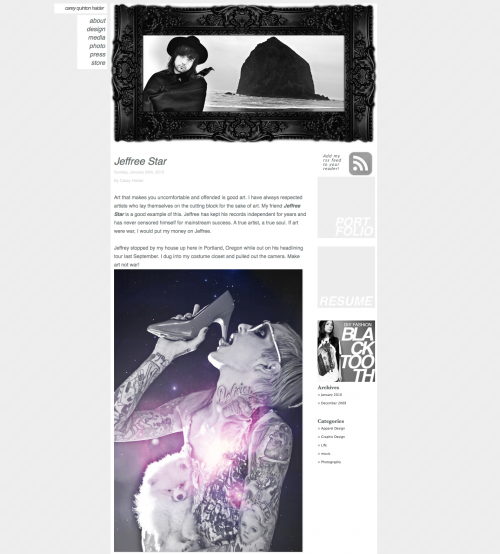 .-= Kiersten´s last blog ..Behind the Scenes of Amazing Artists =-.